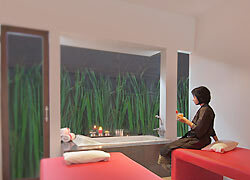 In Bali Island Villas, Taman Merah Spa is located, in the Kerobokan district. As name of “Merah (red),” there are red color modern private rooms and you can take high quality treatment by well-trained therapists. The concept of Taman Merah Spa is “rejuvenation = become younger”, and the spa original products are created from flower and plants in Indonesia, and sea salt. This stimulating treatment is used to release head tension and encourage Blood circulation to clear the mind and leave you feeling revitalized. Designed to eliminate stress in the back and shoulder region, this Invigorating treatment focuses on relaxing the muscles to allow fluid movement. Feel the touch of a Balinese exotic massage to relieve the tension. And tiredness of your body with thumb and palm pressure. A full body massage without oil focusing on the point from the sole. Through out the body by pressure by thumb palm, arm and elbow. A soothing therapy that implements the art of touch with essential Oils to help you achieve balance between the body, mind and spirit. Combination massage of Balinese and Swedish by using elbows. Massage for expecting mothers who has been pregnant over 4 months. The heated river stones of this invigorating treatment penetrate the Skin to alleviate muscle tension and ignite the senses. This delicate cleansing ritual nurtures the feet, which are a frequently neglected part of the body. This ancient curative technique stimulates reflex points on the Feet that relate to specific body parts to evoke health and vitality. An Indian Oil Massage treatment in which warmed medicated oil steadily Drips on the forehead, ideal to pacify your feel, stimulate The scalp and added fullness and Luster hair. A popular Indonesian treatment that massages the scalp with a rich Conditioner to strength follicles and nourish the hair to achieve a glossy look. A deep cleansing treatment using high quality products that will leave your skin with a healthy glow. To gently exfoliate the skin and make it feels fresh. A new level of hair care program that gives the hair the extraordinary feeling of a Spa treatment for smooth luxuriously shining hair everyday. 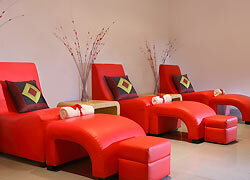 Full nail grooming combined with massage to smoothen and pamper your hand or foot. An indulging combination of a 90 minute Aromatherapy Massage with your choice of Foot Massage or Head Massage. A nurturing 90 minute Aromatherapy Massage followed by your choice of Beauty Treatment. 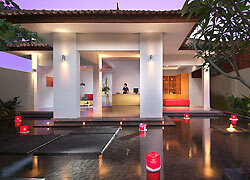 Our signature treatment is composed of an energizing Balinese Massage followed by your choice of Beauty Treatment. In the ultimate quest for wellness, this is a combination of your personal choice of healing and beauty treatments for the duration of 180 minutes. Scrub Body Massage and Papaya polish make your skin beauty. Our most luxurious package is designed to pamper you into a state of supreme bliss and includes an Aromatherapy Massage, Foot Massage, Head Massage and your choice of Beauty Treatment. Children can wait at spa lobby or inside treatment room. Spa offer treatment menu from Age14. “Merah” means red in Indonesia language. 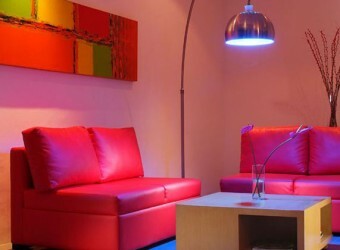 Red dominates the color of spa interior and decoration such as sofa, bed, etc. I felt relaxed with essential oils.